I remember back in 2006, I managed to discover a stock which I was pretty sure it would have risen at least 40% to 50% - and it just needed a little bit of time and holding power. Looking back and after searching through the announcement, I am just trying to remember the past. I did not take the opportunity as I just bought some 7,000 units, which was too little. QSR (then the controlling shareholder of KFC) made a general offer for KFC after triggering the 33% GO threshold. During then, QSR (under Johor Corp) just managed to take control of KFC. It wanted to consolidate its position, hence triggering a General Offer ("GO") at RM4.94 per share during which the price was considered very low. KFC was a cash cow as many would know, however for far too many times, there were just too many interested parties and the latest was Johor Corp. Johor Corp however does not have the funds to do the GO, hence CIMB acted as the financier. You see, seldom a bank would provide financing for an acquisition as such through a GO except for this particular case which include the pairing of state-owned organizations (in this case both of them are). To initiate the GO, the price of the shares had to be cheap, hence it was priced at a single digit PE for an attractive company such as KFC (KFC's cashflow was indeed and in fact better than its earnings, if you know what I mean). At RM4.94, of course the GO will not turn into a Mandatory GO as it was fixed at too low a price, hence QSR was accumulating the shares (to close to 50%) with CIMB financing it. I knew that with CIMB financing QSR, the price of the shares would definitely rise post GO period as firstly QSR would need to repay CIMB for the financing (at market rate) and because of that, QSR being the controlling shareholder would force KFC to pay very good dividends as through the dividends from KFC, only then QSR can pay for the interest charged by CIMB for the financing of the accumulation of KFC's shares. Also, because of QSR wanted to increase to a decent percentage holding of KFC, it would not want to reduce holdings of the company (after all the hard work), hence the need for very good capital appreciation and dividends especially. During the GO initiation period, QSR at that time would not allow the shares to rise above RM4.94 as if it were to rise, QSR would not have the chance to accumulate the shares at RM4.94. Accumulating it at a higher price would have triggered the GO at a higher price, which was not what QSR and CIMB wanted (I think). I hence (together with QSR) seeing the plan, accumulated 7,000 units at RM4.94 per share. I was seeing the plan (without being an insider) from the actions, as I was monitoring KFC all along. KFC has always been a prized asset, until today. However, I did not take a plunge on the exercise as I was following the Benjamin Graham's principles (not to over expose on a position). Hence, I only took a RM35k decision and at price of around RM6 - RM8 I sold the shares, making a decent return but it was not good enough as (again) I was seeing the plan all along. 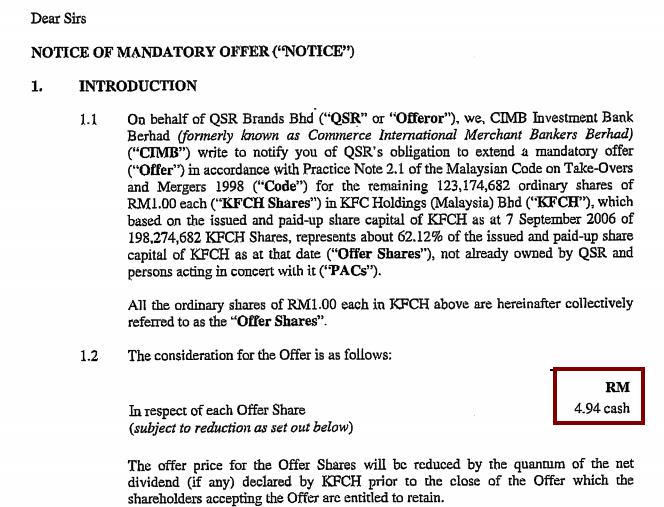 Of course, 6 years after that GO, KFC was delisted at a price of RM4 (after a combined split and bonus exercise of 1 share into 4 shares). So, if one is to purchase the shares at RM4.94, the shares would have effectively be worth RM16 after six years post GO at its delisted price (not inclusive of dividends income during the 6 - 7 years period). Hence, the person if to hold the shares from December 2006 until the delisting would have earned slightly less than 4 times at which price, the GO (RM4.94) was offered at in 2006. I actually have family members and friends who did hold onto the position for that entire period. These kind of things does not recur often, and I am rueing the lost opportunity as I was just too careful, as I see it today. Another lesson here is that shares investment is not just entirely about fundamental. And again, these are partly my speculation which may not be true (as I see it). Felicity, a great article as always. But I don't get your point on "... shares investment is not just entirely about fundamental". You mentioned that KFC was trading at single-digit PE with good cash flow, and you talked about paying dividend from the cash pile, plus the insider was accumulating shares, isn't this all about fundamental? I think I forgot to mention that the share's price was held at around RM4.94 for quite some time. In this particular case, I was not looking at the fundamentals of KFC only, as I was not really interested if Johor Corp is to control the company. Anyway, In this case, I was just able to see through the plan and was pretty sure that the price was not going to stay at RM4.94 or below. I am sure all of us have had those moments. If you have a proven method or strategy that works and that you are comfortable with, stick to it. Chances are it has helped you profit more than what you could have potentially lost. Personally I don't think there are lost opportunities, just investment decisions. When things like this happens I just smile and look for opportunities elsewhere. All the smarts in the world can't predict the stock market. All corporate action need susport by investment bank, right. Correct me if wrong. No, not all. In fact, I would think most do not depend on investment bankers assistance. Is TA really a stockbroker? What is the OSK family up to? It's the BUSINESS and PEOPLE!